Europe’s leading event for marketing, call centres and outbound sales. Last year’s B2B Marketing Expo and The Contact and Call centre Expo were huge successes. This year we expect an even higher attendance. This annual event will equip you with the tech and strategies that will be transformational. Mark your calendar for March 27 – 28 at the ExCel London. Many of our customers who have contact/call centres/outbound sales teams were at last years show. After meeting with them at the show it was clear that their attendance had a significant impact on their operation over the last year. This is your chance learn how the latest technologies can benefit your strategies and as the lead sponsor we are in a prime position to help. 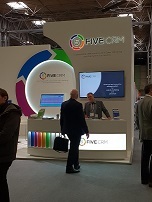 As mentioned in our first email FIVE CRM are the lead sponsor of the above events and you can still register for your free ticket now. Use quick dialing, call list management, orders, reporting, user management [more]. Develop prospects over time, accumulate information, call scripts, statistics and reporting [more]. Combine email and calling campaigns to generate leads. Email marketing can be used to initiate the contact and followed up by call [more]. Nurturing leads, manage prospects by regular contact to drive through the sales cycle [more]. Complete customer information, include history, products, orders, activity tracking [more]. Please contact us for more information and to book your no obligation demonstration. As I mentioned in my previous email in the build up to the B2B Marketing Expo and The Contact and Call centre Expo, if you need a call centre CRM that is highly flexible and highly functional, look no further. FIVE CRM was built from the ground up to be among the most configurable on the market. In preparation for the B2B Marketing Expo and The Contact and Call centre Expo this year, I want to focus on our FIVE key areas which are Telesales, Telemarketing, Lead Generation, Lead Management and Account Management. Use CTI to integrate with your phone system, the ability to auto-dial means that efficiencies are drastically improved. Agents can click-to-dial, or alternatively the system can dial automatically. When dialling automatically, it is possible to insert a delay based on the status of the record, i.e. if it is a call-back with notes to be read then the agent will need more time before speaking with the customer. Ensuring agents call the best records goes a long way to getting the best results. In addition, automated handling of call-backs means agents do not have to rely on alarms or other notes. Extensive User Profiles enable admins to tightly control what data agents have access to and how they work. With different ways to take orders, you can choose the quickest and most effective for your scenario. Options to use objection handling to encourage sales. Quantity discounts, manufacturer pricing, tax calculations; flexible document design. Unlimited reporting on sales details. The in-built report writer enables non-technical people to create their own reports on the database. Reports can be list, summary or cross-tab (pivot table), and can be on any data in the database. In addition, reports can be scheduled to run and email automatically. Report layouts can also be designed to have a more aesthetic visual appearance. Please contact us for more information and to book your no obligation demonstration. You can call me on 01249566010 or just reply to my email. Next week we will look at Telemarketing. Of course, if you want to discuss one of other FIVE areas we specialise in, don’t hesitate to get in touch. Email campaigns are a very cost effective way to drive lead generation. From a targeted list of contacts, data selections can be made, and multi-step campaigns scheduled. Each step can be driven from the previous step in terms of selecting recipients who opened a previous email or clicked on a specific link. The system automatically excludes recipients who previously unsubscribed (i.e. unsubscribing is applied instantly), as well as duplicate and invalid email addresses. Lead generation typically includes outbound calling, whether cold or warm it needs to be done efficiently. As a call centre CRM this system has everything needed from automatic dialling, to automatic call-back management and agent management, also full scripting and call guides can be created. Generate leads and sales on the web, in emails, SMS or via social media by creating outstanding landing pages. With FIVE CRM you will have the tools to capture as many sales-ready leads as possible. The webform functionality means web contact forms can feed the database in the same way that they can be used to send appointment feedback into the database to close the loop. Next week we will look at Lead Management. Of course, if you want to discuss one of our other FIVE areas we specialise in, don’t hesitate to get in touch. Do you have a specific question, comment or enquiry? Simply fill out the form and we’ll get back to you soon.